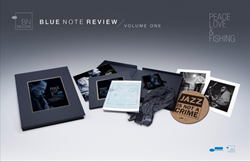 Blue Note Records introduces Blue Note Review: Volume One - Peace, Love & Fishing, the inaugural edition of a stunning new biannual, limited edition, luxury boxset subscription series that encapsulates the storied past and auspicious future of the legendary jazz label. The beautifully curated collector's item is a limited production of 1,500 sets, and is available to order today for $200 exclusively at bluenotereview.com. Watch an unboxing video of the Blue Note Review here. The foundation of each Blue Note Review is and will remain the music: The Finest In Jazz Since 1939. Each set will contain a collection of new recordings from Blue Note’s current roster plus a timeless treasure from the Blue Note vaults, representing the unique continuum of jazz, a music where innovation is always built upon what’s come before, yet a restlessly creative artform with improvisation and reinvention at its core. And so, bucking the digital trend in music, the Blue Note Review aims to provide the ultimate jazz experience, a physical extension of the enduringly hip Blue Note aesthetic to adorn the ears, eyes, mind, and neck. The new music within will only be available in the Review, it won’t be found on streaming services or digital download sites, and none of the items contained in the set will be sold separately. A 2-LP, 180g vinyl double album (2-CD set also included) of new & previously unreleased recordings by current Blue Note artists including Wayne Shorter Quartet, Charles Lloyd & The Marvels, Dr. Lonnie Smith, Gregory Porter, Kandace Springs, Terence Blanchard, Derrick Hodge, and Blue Note All-Stars featuring Ambrose Akinmusire, Robert Glasper, Derrick Hodge, Lionel Loueke, Kendrick Scott, and Marcus Strickland. A 180g vinyl reissue of the previously out-of-print rare classic catalog album Step Lightly by trumpeter Blue Mitchell, recorded in 1963 with Joe Henderson, Leo Wright, Herbie Hancock, Gene Taylor, and Roy Brooks, and featuring liner notes by Michael Cuscuna. Two never-before-released Francis Wolff 12x12 lithographs of Wayne Shorter and Stanley Turrentine. An exclusive John Varvatos-designed Blue Note scarf. A “Jazz Is Not A Crime” turntable mat conceived by Ryan Adams. A lifestyle zine featuring a fascinating collection of articles and musings including: a foreword by spiritual teacher and author Ram Dass, a poem by Jack Grapes, a conversation between Wayne Shorter and actor/comedian/jazz fanatic Jeff Garlin, an eloquent elegy for the late drummer Billy Higgins written by Charles Lloyd, and a true-to-life comic drawn by Keith Henry Brown about an encounter between Stanley Turrentine and Blue Note founder Alfred Lion as told in the words of Bobby Hutcherson.